If you have been thinking that you would never be able to afford a stationary bike, think again! The Exerpeutic Folding Magnetic Upright Bike with Pulse is quite modest when it comes to covering space for the sturdiness that it provides. Its ergonomic seat is large and comfortable which would be refreshing for a change. It comes with a V-belt drive and flywheel along with a crank system for smooth operation. Its highlighting feature includes the LCD screen which is quite adequate. Let’s take you through the point-by-point review of the Bike’s features to help you decide easily. This bike is amazing when it comes to taking up space as it is quite compact and is appreciated by people who don’t have much space. Also, it is foldable, which means it will cover even less space when not in use and you wouldn’t have to worry about it lying right in the center of your living room covering all the space. 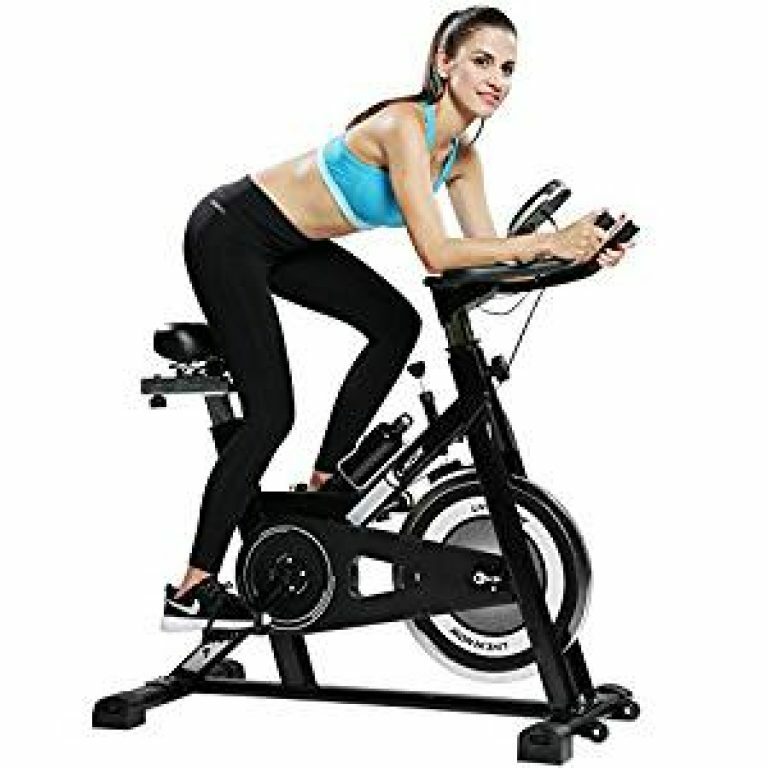 A good exercise bike is one which is able to leave a good first impression which means it should be able to look like it would support your weight and stand sturdy easily without getting wobbly. Fortunately for you, this bike is absolutely sturdy and built well. Its frame is constructed using heavy-duty steel tubes and can support up to 300 lbs of weight. It comes with a large ergonomic seat which is super soft due to the generous padding making it extremely comfortable. The bike comes with leg stabilizers to prevent it from tipping off while you work out conveniently. It is also equipped with wheels and is light enough to be transported from one room to another easily. Some of the users are of the view that the bike doesn’t really behave like an upright bike since the pedals are mounted really forward which demand you to put in extra effort while pedaling. Which is not good since you will have to apply more pressure on your back while it already doesn’t have a seat support. The bike has a smooth running operation though thanks to its high-torque crank system made out of three pieces which ensures that the pedaling motion doesn’t get suddenly interrupted in the midway. It comes with 8 different resistance levels for you to work out on your weight. Also, the bike is capable of providing a very smooth and quiet operation thanks to its V-belt drive and the flywheel that you wouldn’t be hearing any annoying and pesky screeching sounds. This enables you to go about watching TV while are exercising, as it also comes with a TV remote holder to make things all the more easy for you to manage. The amazing bike also comes with an LCD screen which is quite basic but still adequate. It also includes a heart rate monitor and a calorie counter while I am more impressed by its speed and mileage data which is actually more important too when it comes to working out. If this doesn’t satisfy you, you might also use separate trackers for more precise results. Comes with instructions and tools for assembling which is quite quick and easy. Provides a low impact workout. 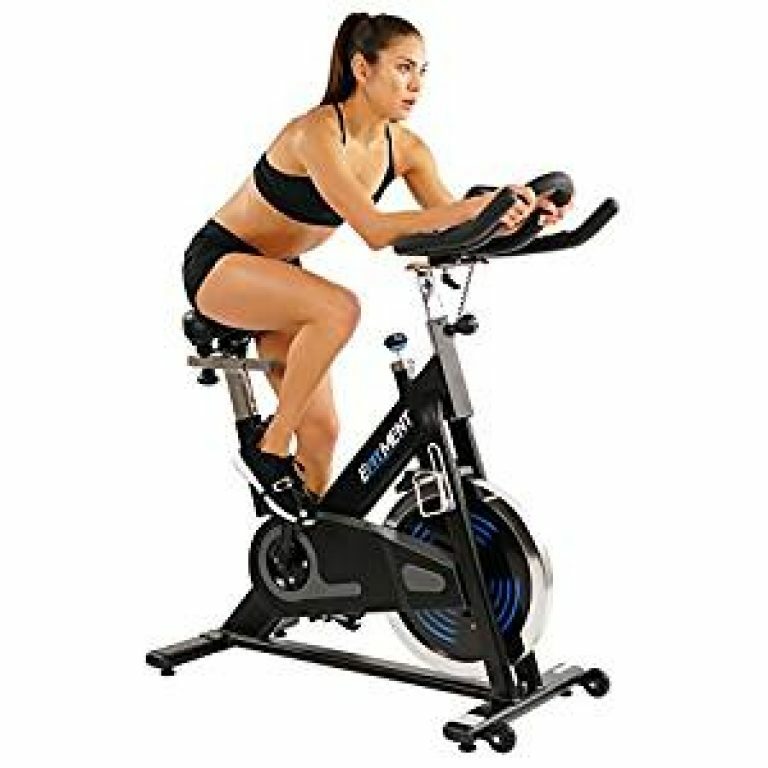 The affordable price makes it convenient for people looking for low impact cardio to work out right from the comfort of their homes. It is a space saver for apartments and homes due to its small footprints and the folding feature. The rollers and leg stabilizers make it easy to transport and balance respectively. Sturdy-built so that it doesn’t wobble while you work out conveniently. Resistance is adjustable making it easy to transition to harder workouts as well. It has a holder in front which comes handy for TV remote or even your smartphone. I can be used by people of heights in the range 5’ 3” and 6’ 1” for getting in shape, losing weight and even knee injury(with the approval of doctor) from simple to moderately tough workouts. Isn’t capable of working as a spin bike as its pedals aren’t positioned in a way to allow standing on them. It isn’t suitable for an intense workout so the serious athlete would find it quite basic. No holder for water bottle and tablet etc. Doesn’t include the recording feature so can’t be used for tracking purposes. The affordability and durability are the highlighting features of the bike. 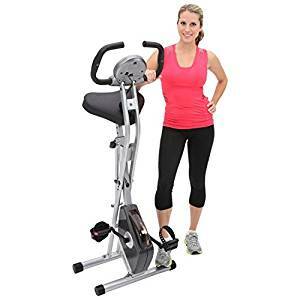 You don’t want to keep buying a bike every few months and Exerpeutic Folding Magnetic Upright Bike is good at that as it is built to last made from quality material. It might not be suitable for people looking for intense workouts but is almost perfect for the ones who wish to keep in shape with the help of moderately intense workouts.